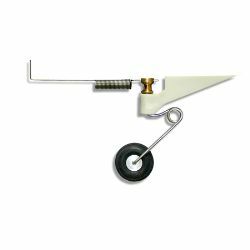 Tailwheel Bracket, .20-.40 Key Features Solid plastic bracket mount 1/16" diameter spring steel axle 2 steering springs ( 1 heavy, 1 light ) for desired steering input Tailwheel Not Included Overview Sullivan Tailwheel Bracket 20-40 2-6 lbs This is a complete tailwheel bracket for airplanes. This attaches to the bottom of the airplane and the bottom of the rudder so you dont have to worry about drilling holes in the rudder. For 20 -40 sized planes. Copyright © 2019 New Creations R/C USA. All rights reserved.